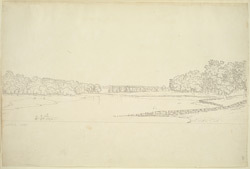 In this sketch Welbeck Abbey appears faintly in the distance beyond the lake. In 1744 the garden designer Francis Richardson redesigned the formal gardens and the lake. A bridge was added in 1765 but when the writer Horace Walpole visited the estate in 1768 it had recently collapsed.